An idealistic young man trains a workhorse to race in this classic horse story from Newbery Award–winning author Marguerite Henry, now available in a collectible hardcover gift edition. Each year since medieval times, the Palio horse race is held in Siena, Italy. Giorgio Terni is a starry-eyed young man who dreams of becoming a horse trainer and riding in the Palio. Giorgio forges a relationship with a beautiful mare named Gaudenzia, and no one believes she will ever be anything more than a workhorse. But, Giorgio senses something great in her, and he’s determined to teach the mare to trust people again—and to become a winning racehorse. 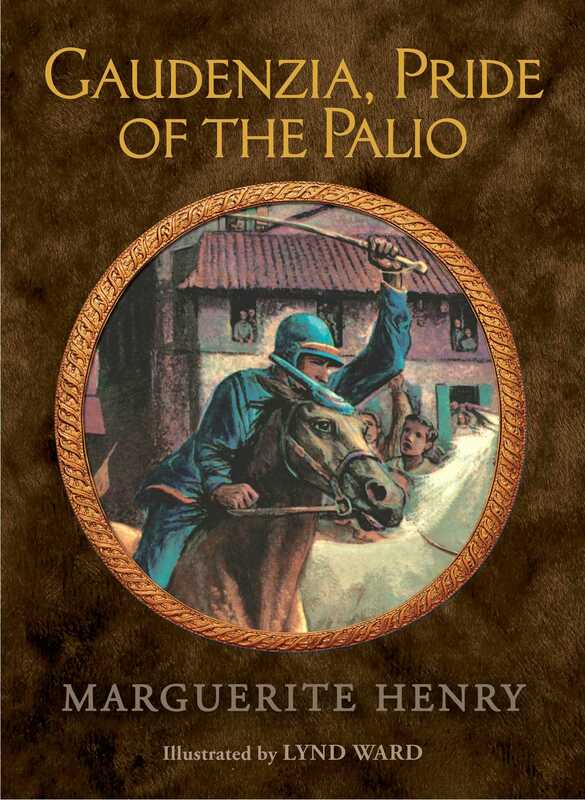 This classic equestrian tale from Newbery Award–winning author Marguerite Henry features the original text and illustrations in a gorgeous collectible hardcover edition. In a hill town of Italy, close by the Tyrrhenian Sea, lives the boy, Giorgio Terni. He is slight of build but hard-muscled and lithe, with dark wavy hair and amber eyes the color of a young fox’s. His town, Monticello Amiata, is named for nearby Mount Amiata. But the countryside that dips down to the sea is known as the Maremma, or “marshy place.” It was once wild and desolate, and it bred strong, earthy men who grappled their living from the wetlands. In the rest of Italy people still think of the Maremma as a savage, wind-blown place where land and sea are not yet separated. They have heard that only work horses and bullocks are reared there, and the people who survive the fever-laden mosquitoes are wild as the sea that goes to meet the sky. But now things are changing. The bogs and sea ponds are being ditched and drained, and the tangle of brown swamp grass is giving way to fields of golden wheat, and to olive groves and vineyards. Giorgio’s father is one of the new farmers. He cultivates a narrow strip of land, and at harvest time pays a little money to the state so that in twenty or thirty years it will be his. But at heart the new farmers remain unchanged. The love of animals is strong in their blood, and they tell with pride that the horses of the Maremma stand taller and show more stamina than those bred elsewhere. It was in Giorgio’s thirteenth year that he resolved to make animals his life. Two experiences came to him in swift succession—one brutal, one tantalizing. When he thought about them later, he knew they were signposts, pointing the way to his future. Work-hardened and tough as he was, the first one shook him like a thunderbolt. He was driving Pippa, his donkey, from the hilltop village of Monticello down to the valley of his father’s farmland. It was a clear, bright day, with only a capful of wind. Spring was in the air—grapevines sending out new runners, swallows hunting straws. Then all at once the bright morning went black with horror. Near a wayside shrine Giorgio came upon a swineherd mercilessly beating a small, shaggy donkey. With each blow the dust rose in little clouds from the donkey’s back. As Giorgio drove up, he saw that the creature was trying to lunge away, but he was tied fast to a tree. The sight threw the boy into a blinding rage. He jumped from the cart and caught at the rope. The man turned in surprise, sweat dripping from the beardy stubble on his chin. He jerked the rope from Giorgio’s hand. “Why not kill him?” he bawled out. “Too stubborn he is to live!” Taking a fresh hold on the stick, he hit the donkey across the rump, the back, the ears. “Stop!” Giorgio shouted again. He braced his feet. His arm muscles went hard and tight. He waited for the stick to crack across his face. But it did not come. It kept right on flogging the mouse-colored donkey, a-whack, a-whing, and a-whack, until with a grunt more sob than bray, he fell to his knees. With one arm the man flung the boy out of his path, then came stalking at him, making bull’s horns of his first and fourth fingers. He thrust them almost into Giorgio’s eyes. “You meddling runt! How’d you like the stick against your hide! Run for your life, or I . . .” His hand came up in a threat. Giorgio stood his ground. He was only a little afraid. He hated the smell of the sweat-dripping man. “I will! But first I drive Pippa to our farm.” The boy ran back to his cart, lifted Pippa’s head with the lines, and down the road the donkey clippety-clopped as if there were no time to lose. Giorgio glanced back to make sure the swineherd would wait. The man had flopped down in a slab of shade made by the shrine. He was mopping his face and at the same time pulling a plug of tobacco from his pocket. The farm was only a kilometer away, and Giorgio soon returned on foot. With tiny new carrots and a pocketful of grain, he coaxed the donkey to his feet. Carefully he loaded him with the crates of pigs, making sure the ropes did not bind, and he tucked rags under the pack to cushion the weight against the sores. Then slowly he led the donkey to market, talking and praising him all the way. The swineherd, sullen and silent, plodded along behind. Three times that week Giorgio worked Long-ears, and he neither kicked nor balked. He seemed to know a friend was leading him. He accepted each load meekly, as if it were the sun or the rain. He even let himself be ridden, the boy sitting far back between the crates singing “Fu-ni-cu-li! Fu-ni-cu-la!” at the top of his lungs. The taunts enraged the man, and when no one was looking, he continued to take out his fury on the donkey. There came a morning when the little beast no longer felt the pain of the floggings. He was dead. When the news reached Giorgio, he stopped what he was doing and made a hard fist of his right hand. Then he struck the palm of his other hand again and again, until the stinging made him quit. The hurt somehow helped him feel better, as if he had delivered the blows to the swineherd’s fat, dripping face. On the surface, life went on as before. Giorgio worked in the fields with his father and his younger brother, Emilio. And he worked for his mother and his sister, fetching water in great copper pitchers from the street fountain, and carrying trays of neatly shaped dough to the public bake oven. But he thought often of the swineherd’s cruelty. “I will not laugh,” the father replied as he opened Giorgio’s schoolbag that now served as lunchbag. The father nodded as he chewed. Young boys’ heads were full of dreams. He had once dreamed of leaving the Maremma country himself. “It costs dear to travel,” he warned. Giorgio was only half listening; he was on a big-going horse, sailing right over the cone of Mount Amiata. If the swineherd and his donkey had planted a seed in Giorgio’s mind, it was the Umbrella Man who made it grow. He came yodeling into Monticello one misting morning three months later. “Om-brel-lai-o-o-o!” His voice rang out strong and clear as the bell in the church tower. “Om-brel-lai-o-o-o! I doctor the broken ribs! I patch and mend! Pots and pans, and china, too. Om-brel-lai-o-o-o!” And he strung out the word until it rolled and bounced from house to house. Shutters flew open, heads popped out of windows. A crock of geraniums fell with a crash on the cobblestones below. Children danced for joy, old men brandished their canes like batons. Giorgio, who had been filling pitchers at the public fountain, ran for home, spilling the water as he flew. His mother turned away from the stove, smiling. It was good for a change to have Giorgio seem more boy than man. She took from the opposite wall, next to the family’s hats and caps, an enormous green umbrella with a loose hanging fold made by a broken rib. “The tinker man works magic if he can fix this,” she laughed. In a flash Giorgio was at the door, umbrella in hand. “Wait, son! Wait!” She looked at the eager boy and quickly counted in her mind the pieces of money in the sugar pot—the soldi and the lire. Yes, if she carried the big red hen and one or two rabbits to market, there would again be the same money in the pot. She went to the end of the narrow room that served as kitchen, dining, and living room. Opening the bottom doors of a tall cupboard, she took out the broken pieces of a bake dish. It was the one, Giorgio saw, that he had clumsily dropped on the stone floor. Next she counted out a hundred lire. Thinking of the cost, Giorgio looked at his mother in astonishment. Ever since the incident of the donkey she had tried in little ways to make up for his sorrow. She had fried crispy hot fritelle for him when it wasn’t even a feast day. And only last night he had found under his pillow the last piece of nougat left from Christmas. Now this joy! For it was Uncle Marco’s rule that whoever brought him the most work could ask the most questions. “Si! Si!” he answered, kissing her soundly on the cheek. Then he threw back his head, and whinnying like a King Horse ran joyously out of the house.